One of my go-to flies this past year is Lance Egan’s Rainbow Warrior. For some reason, trout really love it. It’s bright, has an interesting thorax from a magical material, and has a red-thread body underneath some plastic material. And, it’s extremely rugged. As I’ve blogged before, Lance is on the national fly fishing team. I often fish his Red Dart fly, and people credit him for bringing back to the U.S. the Frenchie fly. So, when I read about the Rainbow Warrior, I simply had to try it. Some people think it is a fly mainly for winter. I’ve found that it works year-round. It’s an attractor-style fly, which I really like. Match-the-hatch works as well, but, I like carrying few flies to the river. The magic ingredient is Rainbow Scud Dubbing, which contains tan, yellow, pink, red and blue. Most vendors sell two color shades. I’ve seen both and went with the light version. 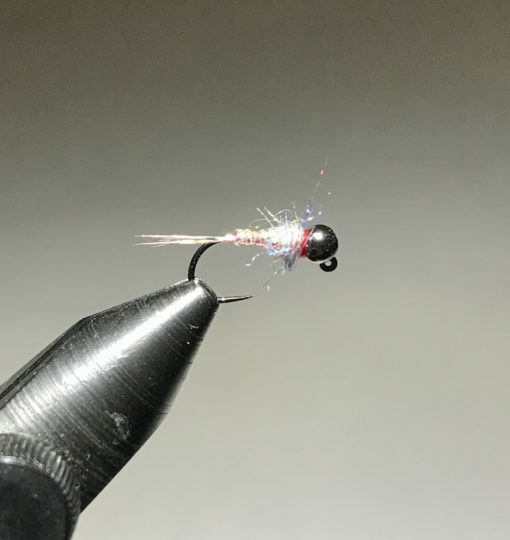 Many prefer the dark version, but, my flies work very well. To the left is a picture of the two colors. There are many versions of this fly. Mine leverages the materials I already own. I use Coq de Leon for a durable tail. I don’t bother with Pearl Tinsel and instead use Krystal Flash. Most people use a silver bead, but I find black to be just fine. ICYMI, detailed and step-by-step instructions here via famed angler Loren Williams. This is a pattern I’m excited to try, thanks for the recipe! I’ve got extras, if you want them! What color of Coq de Leon are you using for tails? I have both the dark and the light ones. I’ve not noticed a difference between the two on take rates. If a dark fly, I use a darker tail. If a light fly, I use a lighter tail. But, that is more for me than the fish.